The Sanskrit term Mahāsiddha (“great master of spiritual accomplishment” or “great adept”) and the simpler, near synonymous form siddha (adept) refer to an individual who has achieved great success in tantric meditation. Buddhist traditions mainly associate siddhas with the transmission of tantric instructions throughout South, East, and, to some degree, South-east Asia. They are especially important for the Buddhist schools of Nepal and Tibet, which commonly enumerate 84 Mahāsiddhas, many of whom are regarded as founders of tantric lineages still in existence today. b) the supreme accomplishment of perfect Enlightenment. Life stories of individual siddhas abound with examples of the first type of success: mastery over the physical elements and material world, superhuman cognition, even immortality. Siddhas are commonly associated with particular displays of accomplishment: for example, Virūpa’s ability to stop the sun midcourse and Saraha’s immunity to the heat of molten metal. According to tradition, however, such powers are mere by-products of tantric meditation, not the goal itself. Siddhas or Mahāsiddhas qualified by the 2nd type of accomplishment therefore stand as the Vajrayāna Enlightened ideal - a model for swiftly attaining realization and ultimate Enlightenment through the practice of meditation and yoga. The majority of these accounts are known from the rich corpus of biographical literature preserved in Tibetan, often based on oral and literary traditions from India. Prominent among them is the 12th century author Abhayadatta’s Lives of the 84 Siddhas - extant in Tibetan translation - which presents brief biography for numerous important masters. The Seven Instruction Lineages, written by the Tibetan historian Tāranātha (1575-1634), records elements of siddhas’ lives as they pertain to the promulgation of important tantric lineages. Several widely revered siddhas, such as the Bengali master Nāropa (1016-1100), have been the subject of comprehensive biographies. Accounts of the Mahāsiddhas generally portray individuated personalities while following tropes common to much of Buddhist sacred biography - discontent and renunciation, practice of austerities, the overcoming of difficulties, and eventual realization. Some were born into royal families, others to uneducated labourers. Many began their lives as monks or scholars in one of the great Indian Buddhist universities. Most were compelled at a certain point to abandon their ordinary life, the monastery, or the throne, in favour of mountain solitude and a life of meditation and yogic practice. Some studied under a living master (occasionally another siddha), others received teachings through direct visions of the Buddha. After attaining siddhi, they often led the life of a wandering ascetic, or appeared in the guise of a yogi-madman, intentionally transgressing the normal parameters of religious practice. but hundreds of works - including tantric commentaries, liturgies, and meditation manuals - attributed to Indian adepts are also preserved in the Tibetan canon. 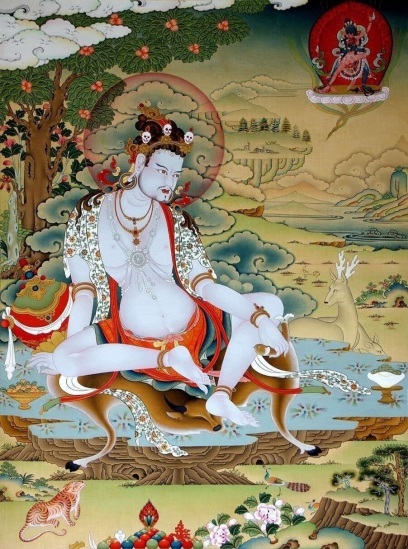 As objects of meditation, devotional prayer, and religious art, the figures of the siddhas themselves form an important locus of religious practice throughout the Himalayan Buddhist world. - Virūpa, source for the Tibetan doctrine of path and fruition of the Sakya tradition.